February 25, 2011 by The CC. 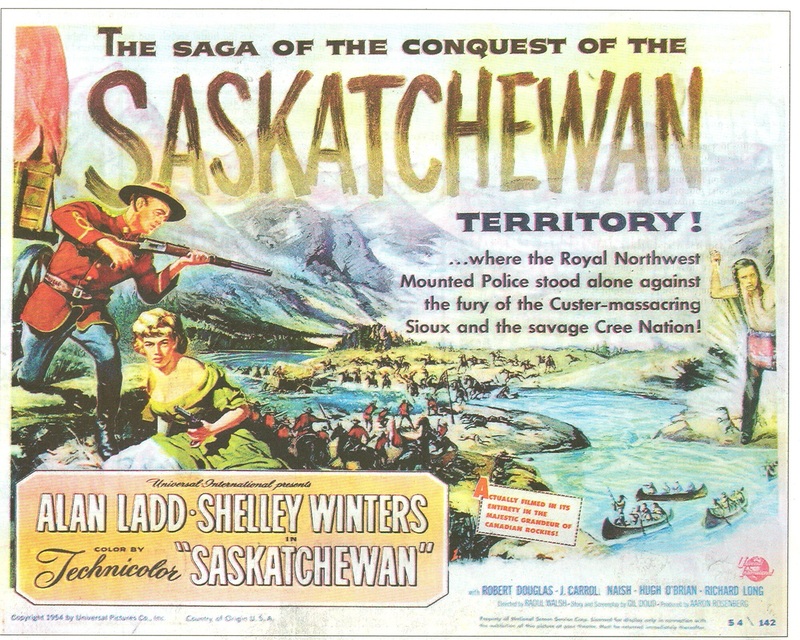 “Saskatchewan” The Movie (1954). It’s Old School. Where oh where is this movie? I have to find it, watch it, and comment on how bad and/or good it is. Have you seen it Julie? This is from someone who was actually on the set during shooting of “Saskatchewan” in the comment section on IMDB. I have not edited this any way. I was there on location for this film and it was filmed mostly in Alberta in the vicinity of Lake Louise and Banff. It rained a lot during the filming and a lot had to be redone at the studio. I was an extra and mostly rode horses and was a dead man in several scenes. As a kid it was a great experience. Alan Ladd was wonderful as was Carrol, Shelly and Raoul. They fed us well and we stayed in small out buildings, like motel buildings, near the Banff Springs Hotel. I had to leave early to do a film with Jeff Chandler and I had a commitment at the Pasadena Playhouse at that time also. My last theatre work was in 1960 when I had to give up show business for health reasons — I needed to eat! Hope this clears up the question of where it was filmed. This entry was posted in Canada, Canadian History, Canadian Movies, conquestcommando & friends, Movies, Saskatchewan, Saskatchewan Movies and tagged Allan Lad, Movies mentioning Saskatchewan, Movies with the name Saskatchewan in it, Saskatchewan Movie, Shelley Winters. Bookmark the permalink. I tried to find this movie but the Saskatoon library didn’t have it! I love how they think it could be filmed in banff and represent the prairies. The story line is unashamedly Hawkish American in theme. There few if any attempts at reference to anything historical. It is totally fictional attempt at “western” American action. It’s a total contrast to what actually happened after the Battle of the Little Big Horn. This movie is supposed to occur in Saskatchewan. In this movie you see mountains. In truth, Saskatchewan is so flat that the sun rises and sets on the land. The vegetation, hardly a tree, mostly grassland, aspen, In the movie, spruce trees, they don’t grow, as forests, except 200 miles north of the locations this story was supposed to have happened. The story, fiction, not one thing that is represented to have happened ever did happen. The Cree of Saskatchewan never rose up and fought against the RCMP nor did they ever raid and kill settlers, nor was there any armed conflict with the Sioux that came to Ft Walsh. To this very day there are descendants of the Sioux living at Fort Qu’Appelle, which is North East of the old location of Ft. Walsh.